Indeed, the 50+ new companies that we welcomed this quarter has pushed our client base to almost 600. Because of our significant growth we have recruited 10 new team members in RoadCrew Customer Service, Implementation, Professional Services and Software Development. We now have a team of over 60 specialists. 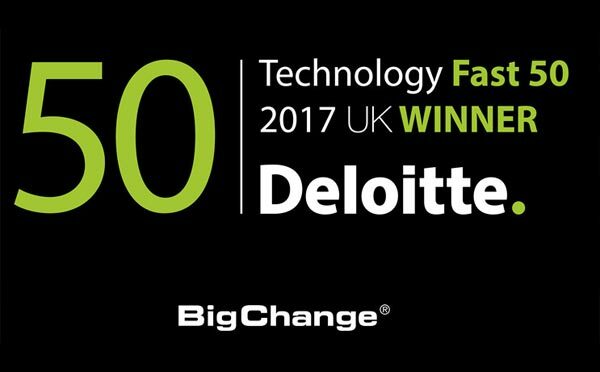 Deloitte 2017 UK Technology Fast 50 Winner in the North East Region. We were also 25th fastest growing tech company in the UK with 1,095% growth over the last 4 years. Four months of intense competition came to a head at the Tech North Northern Stars event. BigChange won along with 9 other companies to represent the North in the European Final in Berlin at the beginning of December. Our success has been recognised by the prestigious Yorkshire Post; we won the Excellence in Business Award 2017 for the Best Company (Up to £10M category). We were proud to receive this recognition and honour. Our teams have been inspired by a series of “Motivational Mondays” that we have held at the beginning of each month as part of our Sales Meetings and Team Building events. We have hosted Falklands Veteran Simon Weston, British Olympian Eddie the Eagle and British Racing Driver Nic Hamilton (Brother of world F1 champion Lewis Hamilton). Each one has inspired us with their own unique story and journey through life. The common theme that unites them is tenacity and perseverance in the face of adversity. It was a real honour to meet them and hear their stories. At the heart of BigChange is a real commitment to corporate social responsibility. We are getting involved with as many Transaid events as possible and we were honoured to meet HRH Princess Anne at one of these events. At this year’s Motor Transport Awards, we bid for Des Evans MBE (former CEO of Man Trucks) & Richard Burnett CEO of the Road Haulage Association to join us as interns for a day. Their advice was priceless, and there is a great write-up about the day in the Motor Transport Magazine. We also recently held a Brexit roundtable, hosted by Clipper Logistics to raise further funds for the Transaid charity this will featured in Motor Transport 13th November edition. We have also teamed up with BRAKE, the charity encouraging safe driving. Nic Hamilton helped us launch this year’s ‘Speed Down Save Lives’ campaign for Road Safety Week that launches on the 22nd of this month. We are a corporate partner of BRAKE and are proud that BigChange technology helps to reduce accidents. The BigChange 4-in-1 System continues to excite SMEs and Corporate Customers from all different industry sectors who are attracted to our seamless and fully integrated system. Our end-to-end solution provides CRM (Customer Relationship Management), Job Scheduling, a rich Mobile App and Vehicle Tracking all-in-one. BigChange helps companies go paperless and digitally transforms businesses. In terms of product development, apart from our weekly software updates (you can find more information on our HELP CENTRE), we have now launched BigChange “Uber for Service and Transport”. This is a customer branded Booking App (iOS/Android) where BigChange clients can rapidly deploy their own on-demand app on the Apple App Store and Google Play Store. The much anticipated iOS version of the BigChange DriverWatch App has also been launched. This is available free with Journey Watch providing 5 key features: Timesheets, Vehicle Checks, 2-Way Messaging, Driver Behaviour and Expense management.